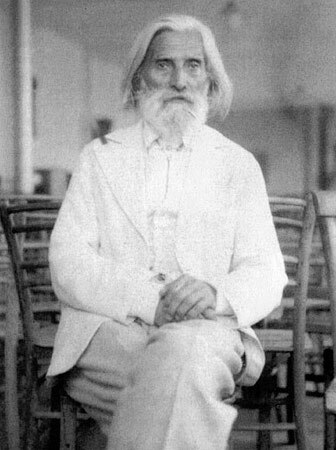 Peter Deunov was born on July 11 (St. Peter’s Day) in 1864 in the village of Nikolaevka, Varna Region, in the family of the Orthodox priest Konstantin Deunovski. At that time it was customary to indicate the birth of a child in the family Bible. On the blank page of his Bible, which he had used for more than 50 years, Deunovski wrote: “The promise of the kind heavenly Father to send to my home His beloved son, as an omen of universal joy for the kin of man, for a better, brighter and more righteous life, has been fulfilled”. Deunovski was the first priest on Varna to preach in Bulgarian and he took the lead of the struggles for clerical independence in the city. In 1872 Deunov started visiting the classes of the primary school in his village, and then graduated from a high school in Varna. After that he studied at the American Methodist School in Svishtov. Then he took the position of a teacher in the Hotnitsa Village near Ruse, where he staid for about one year. In August 1888 he was admitted student at the Drew Methodist Theological Seminary in Medisson, New Jersey and completed his education there in May 1892. In September of the same year he was admitted at the School of Theology of the Boston University. His thesis was on the “Migration of the German Tribes and Their Christianization”, and in the summer of 1893 he took his diploma from that School. He continued his education at the Medical School of the University and in 1894 acquired a certificate, entitling him to practice medicine. There is certain data that during his time spent in Boston, he established connections with Rosicrucians. In 1895 Deunov returned to Varna. He was offered the position of a Methodist priest, but he rejected the offer, which marked the first conflict with the clerical Christianity and set the specific future path of development, which cannot fit in the regular framework of human life. This was the beginning of one of the three periods of his activity. The years between 1895 and 1912 we may call preparatory. During this stage he prepared the foundations of his teaching, studied the environment, in which he lived, and gradually created the forms, which would later transform into resonators of the new ideas. Deunov, called by his very first disciples “the Master”, carried out extensive educational, research and organizational activities. He wrote books, read lectures, participated in the establishment of the “Petko Slaveykov” Community Centre. A turning point was the establishment in 1897 of the “Association for Raising the Religious Spirit of the Bulgarian People”, the members of which were his first disciples. The Association transformed into a Synarchical Chain, which, on it part, later developed into a “Universal White Brotherhood”. The name is a sign of identification of all the adherents and supporters of the teaching. It should be noted here that the White Brotherhood does not belong to the physical field. It cannot be an organization, society or association, and none of its members or supporters can be referred to as a “white brother”. The White Brotherhood is composed of beings, which have completed their development on Earth. The brotherhood is headed by Jesus Christ. Representatives of His are incarnated in a certain time, to fulfill a given mission – for that purpose they need auxiliary bodies, which they can utilize on the physical field. The associations, societies, chains etc. are the forms, through which the Master works. 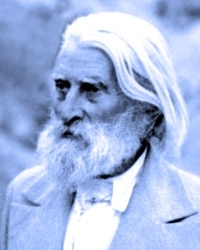 An adherent of White Brotherhood is any person, who once was connected to the incarnated essence of Deunov, and now – everybody who reads and aspires to apply his word. The highest position an adherent of the brotherhood can reach, is disciple. Deunov expressly defined both notions, identifying their relations. “Master” and “disciple” are not ranks, degrees, titles, but conditions of consciousness. No hierarchy existed in the brotherhood, there were no acts of initiation, there were no internal symbols and signs, the participation in the lectures and councils were free, or the significance of any material forms was reduced to the absolute minimum. Therefore, the most important task, the objective of the word is to establish connection with Christ. The complete, unreserved adoption of Christ, transforms the adherent into a disciple of the White Brotherhood. The annual meetings of the chain, and then the brotherhood, were referred to by the Master as councils. The first meeting in 1900 in Varna, was attended by the first three disciples, later, in the 1920s and the 1930s the councils were visited by thousands of adherents of the teaching, and they took place in Burgas, Veliko Tarnovo, Sofia, in the Vitosha and Rila mountains. Between 1901 and 1912 the Master traveled all around Bulgaria, visiting hundreds of cities, towns and villages, giving talks and making his phrenological measurements. In this way he established the parameters – organic and mental – of the national Bulgarian type, among and with which, he was about to work. He entered the data gathered in especially designed and printed phrenological cards. According to some sources, the file-index included approximately 5 thousand samples. In 1912 in the village of Arbanasi, near Tarnovo, Deunov wrote “The Covenant of the Colored Rays of Light”, where certain passages of the Bible are connected, based on their content, to one of the seven waves of the light spectrum. The Master wrote the following words on the title page: “I will always be a devoted servant of our Lord Jesus Christ, Son of God. August 15, Tarnovo, 1912”. During that year, another act of great significance was performed: alone, in the vineyard of friends of his, the Master went through a 40-day fasting, during which he cleansed the physical body and the thin bodies, related to incarnation, and received vibrations of the higher worlds, which would otherwise destroy any mortal person. Later he said that he barely survived – so intensive was the fight with the demons of decay and death. The period 1912 – 1922 marks the second stage of Master’s activity: he moved permanently to Sofia, an active, conscious circle of supporters formed gradually around him, in 1914 – the beginning of the new Age of Aquarius – he read his first Sunday lecture “Here is the Man!” It set the beginning of the series “Power and Life”, which developed the ideas of the new teaching. The talks, lectures, speeches were written shorthand and issued in separate brochures. A team of stenographers and editors was gradually formed, taking care of the preservation of the word. In 1917–1918 the Bulgarian government interned the Master to Varna, under the pretext that he was undermining the fighting spirit of Bulgarian soldiers. On the 24th of February 1922 Deunov opened in Sofia the “School of the Universal White Brotherhood”. This was the beginning of the third, and last, stage of his activities. A General Occult Class and Youth Occult Class were formed, as the Master continued to read the Sunday lectures, the speeches in front of women, morning speeches, the speeches at the Rila and Vitosha mountains, at the annual councils until his death on the 27th of December 1944. He read more than 6 000 lectures, as approximately two thirds of them have been deciphered and published. This is a vast, never failing stream of Devine impulses, which the Master caught and transcribed on the physical field. During that stage the number of his adherents increased rapidly – according to some sources their number exceed 40 000 people. Regional brotherhoods were organized in more than 70 towns and cities. The supporters of the Master, however, were much more: without manifesting themselves they worked in the Royal court and around the King, among the officers, among the clerks, teachers, workers, in villages etc. 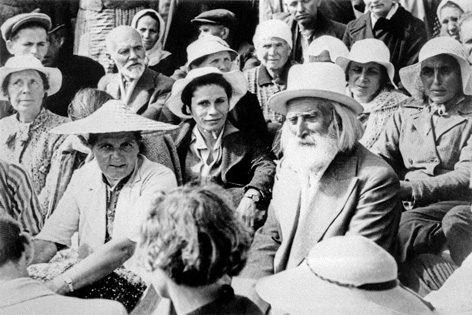 In 1927 the Master established the “Izgreva” (the Down) village near Sofia, where a part of his adherents moved. A building for public acts was also built there – it was where the Master lived and read his lectures and speeches. In 1929 he made a camp in Rila, at the Seven Rila Lakes for the first time. Climbing mountain peaks and staying at high places turned into a tradition, an integral part of the fraternal life. 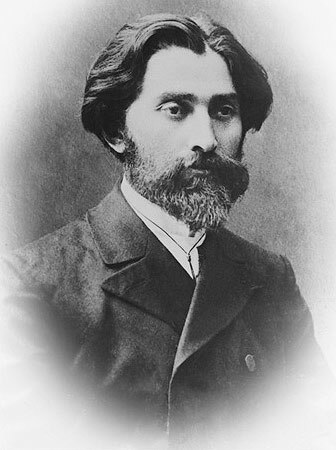 In all his actions Deunov included three layers of consciousness: the first included the physical field – this was the form, the second was the astral world and it was expressed in motion, the third one was connected to the mental world, its manifestations were intuition, self-sacrifice, and joy. The high peaks are conductors of the energies of the mental world. Such a synthesis of the influences of all three worlds is achieved through the Paneurhythmy. After 1934 the Master gradually combined music, word, motion and the shape of the circle, the sphere into one whole. The participation in the Paneurhythmy is a powerful healing method, an act of purification and upsurge. Who is Peter Deunov, also called the Master, with the occult name Beinsa Dоuno and what is his role? Why did he incarnate in precisely that period, and why in Bulgaria – a small country, poor and not very advanced – from the perspective of the objective mind, of rationalism? 1914 was the down of the Age of Aquarius. The objective factors changed: where in Pisces the dominant sign of the zodiac and the ruling planet have a negative nature and (according to the law of attraction of the opposites, which acts in the physical field) they activate the positive, the male current, the sign of the zodiac and the dominant planet of the Aquarius are polarized positively and interact with the incarnated negative current. The negative current includes all the essences, all elements, with fields that are negatively polarized: these are the old Atlantean communities of Latin America, the Slavic Countries, China etc., women, animals and, in general, the astral, soft part of humankind and the planet. This means that in this age the water element will be activated – a phenomenon, which has already started manifesting all over the Earth. It is a matter not only of melting of ices, but also of the internal dynamics that have occurred, which interacts with the other three elements – air, Earth and fire. The change of an age is always accompanied by catastrophes, by dramatic events, which affect the entire Earth. 1914 saw the outburst of World War I, which was a prelude to World War II. The changes in the organic system of man cannot take place in the physical field consciously, mechanically through one’s will. The human essence must be liberated of its physical forms, so that actual movement in the astral world takes place. In this way, on one hand – depolarization happens, and on the other – the result of the past life is sublimated as a new polarity, which – according to the law of opposites – is attracted by a certain center. It is so, because it is in the basis of the change in life that has happened, and also in the essence of each individual afterwards. This is how karmic law acts: if an individual destroys the form of another, or fails to deal with his hatred towards another person, which haunts him even after his death, in his next reincarnation he will attract that other person like a magnet: he will either accept him among his closest circles or give birth to him. That is why karmic action is relentless: in order to be saved, man has to deny the law of attraction of the opposites, which underlies the very existence on earth. Karma accompanies both the collective and individual person, and the communities and societies: the dominant male essence, developed and established through Pisces, which caused and guided both wars, must accept in itself the souls of the ones killed by the negative current and to give birth to them. In this respect in one of his lectures, the Master says: “After the war the nature of these peoples will change radically”. And this really happened: the pioneers of European cooperation, both between the countries in the Western part of the continent, and between the East and West were the German social-democrats of the 1960-s and 1970-s.
Let’s take a look at Bulgaria’s position in collective man’s organism. Once the areas around Black Sea were viewed as the end of the world. When God divided the Earth between the 12 tribes, the ultimate frontier to the West was the “great sea”, where the Sun set. The currents of the Asian continent were directed from the East to the West, so that all astral currents currented to that end-point, to that frontier. They had to be purified and transformed. Therefore the biggest and most famous centers of the ancient world are positioned around Black Sea: on its Eastern shore – Caucasus, Sinope, Crimea; on the shore of the Sea of Azov – Asgard and Korokondame; on the Western shore – the entire community of the Thracian temple servants and Greek mysteries, dedicated to Dionysus, from Eleusina etc. Therefore two worlds exist: one – visible, external, and the other – obscured, dark. The first is physical and adopts the forms of wood and stone, the second is Astral and it is symbolized by water. Therefore in the Underworld, in the Kingdom of Hades, an underground river flows. The currents from the East continued until the 12–13th century, they satirized the western hemisphere, which accepts in itself a new element – air. Depolarization then started: the West was polarized positively and the East negatively. In the next centuries the once positive communities in Eastern Europe lost their national independence and formed a common mass, negative by nature. The currents in Europe orientated from the West to the East. Western currents carry mental and physical cinders, Eastern currents – astral cinders. They join each other in the areas around Black Sea. Therefore this is one of the lowest places in the world, where the upper world and the underworld join together. And indeed, the winds of the East, North, West and South reach this point. The largest rivers of Europe – the Danube, Dnieper and Don - mouth into the Black Sea, and Volga and Ural – into the Caspian Sea. While once the astral world was incompletely incarnated and many people in this region had spiritual vision, and the consecrated ones were able to further define it as a field of work, now it is organically incorporated in Earth’s field, and that is why self-consciousness perceives its ultimate, formal manifestations, but it is incapable of breaking through to its essence. This means that only highly consecrated persons, Masters, can establish connections with the world, where the reasons for the changes in the astral world and the physical field, dictating the condition of man and the planet, are rooted. In the beginning of each age, one Master is born, who adjusts the nature of the changes. Master Deunov is a magus of cosmic proportions. He masters all the known forms of manifestation of super-sensitivity: clairvoyance, healing, capability of emitting his thin bodies and materializing them – i.e. to appear simultaneously at different locations, to speak freely multiple modern languages, as well as the primary, fundamental language, referred to as “vatan”, to communicate with the spirits of nature and the representatives of angels’ hierarchy, to handle the astral and ethereal bodies of other people etc. Or, we may say this: he is a being, whose consciousness covers all 360 degrees, or that the Master has walked all the way along his path in the physical field, his is karmically free to reincarnate, in order to fulfill God’s will. Another notion, which we may use to characterize his nature is androgyny. This means that he has already processed and is now combining harmonically both currents – the positive (male) and negative (female), and that is why he resides in an over-physical, over-astral world and the related fields. This enables him to interact with the spirits of the East and West, of the Black and White Lodges. Through his word the Master saturated the space of Bulgaria and the world with certain impulses, which act through all the stages of the age. The main subject of all the lectures and speeches is Love. Why Love? Because the astral, water, sentient world is activated during the Age of Aquarius, and its higher level of organization is expressed through Love. And this is not based on the law of opposites, but the feeling of community, based on the law of attraction in the supreme worlds. This means that people have to establish the relations among themselves, like souls, like superphysical, superformal beings. This change can only happen through adopting Christ, who personifies and embodies this unity. “I am the vine; you are the branches. If you remain in me and I in you, you will bear much fruit; apart from me you can do nothing.” (John, 15:5). In one of his lectures, the Master says: “Christ is a woman”. This is the organic, sacrificial side of Love. The ways and methods of this transformation are contained in Peter Deunov’s words. They describe the changes, which will occur in the Earth and in man, they also characterize all spheres, all conditions of consciousness. Deunov is the Master of the Aquarius: he was incarnated in the right time and in the right place, he followed Christ and expressed God’s Revelation for the times to come. The nature of the age cannot be understood, without his words.